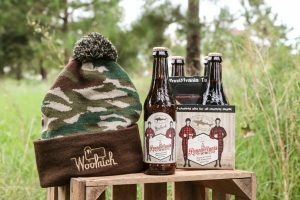 Milton, Del., September 28, 2018 –Long time collaboration pals, Dogfish Head and Woolrich, went deep into the woods to bring back Pennsylvania Tuxedo; a pale ale brewed with Pennsylvania spruce tips, and are also releasing a new limited-edition camo hat. Shipping late September, Pennsylvania Tuxedo (8.5% ABV) has a grassy, citrus kick with resinous conifer notes, balanced by a dry, yet doughy malt backbone. Every year since the first beer launched in 2014, friends, family and employees of the Woolrich company come together to harvest new growth spruce tips for Pennsylvania Tuxedo, hand-picked from the forests outside their factory in central Pennsylvania – a family reunion of sorts. The idea behind the collaboration was inspired by a story from the mid-19th century when Michael Bond Rich, grandson of Woolrich founder, John Rich, had an unforgettable encounter with spruce beer. The incident occurred when his father was hosting a barn raising. The young M.B. 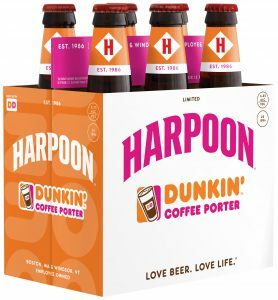 Rich recalled, “On account of rain on the day set, the raising was postponed a couple of days and the spruce beer which was prepared had acquired a potency not intended. As it was accessible to me, I drank quite freely and, when later on I stooped over to get a drink from the spring, I fell in headfirst and was too much intoxicated to get out.” Luckily, M.B. Rich was saved by a woman who happened to be fetching water from the spring, and the young boy lived to tell the story that helped Dogfish Head create Pennsylvania Tuxedo. Celis Brewery held it’s IPA Challenge over the last few weeks, inviting beer lovers to vote for their favorite Celis IPA. The contenders included Celis Citrus Grandis, Celis Citrus Maximus, and the newly released Celis American IPA, and Celis Juicy IPA. 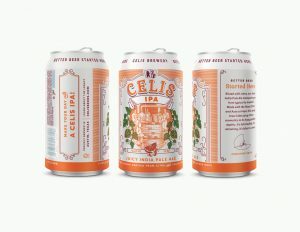 The winning IPA will be the next beer from Celis packaged in cans. Celis Juicy IPA will be available in cans in stores throughout Texas in January 2019. FISHERS, Ind. – After receiving more than 600 name submissions, Conner Prairie and Sun King Brewing Company announce “Ichabrewed Crane” as the official name of the Headless Horseman Festival brew. The contest winner received a four-pack of tickets to Headless Horseman, a $50 Sun King Brewery gift certificate and a commemorative Headless Horseman growler. The copper ale will be available from 5-8 p.m. on Wednesday, Oct. 10 at a tapping party at Sun King’s small-batch brewery and taproom in Fishers. All ages are invited to attend this free event where Conner Prairie interpreters will be on hand to help celebrate this launch and join in family friendly activities including pumpkin decorating. 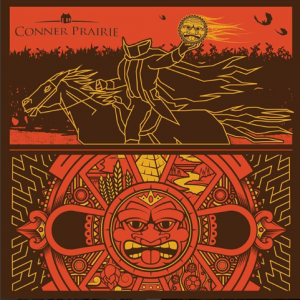 Fans of Conner Prairie and Sun King will be able to purchase for a limited time, commemorative growlers showcasing the art for “Ichabrewed Crane.” Growlers can be purchased inside The Conner Prairie Store and at Sun King’s Fishers tap room for $20. Visit connerprairie.org/things-to-do/events/headless-horseman for more information. AUSTIN, TX, SEPTEMBER 27, 2018 – Oskar Blues Brewery in Austin, Texas, is now brewing their flagship beer, Dale’s Pale Ale, using locally crafted malt developed by neighboring malthouse, Blacklands Malt. Dale’s Pale Ale has historically been brewed with commercial Munich malt; but an idea started germinating when Oskar Blues’ Head of Brewing Operations, Tim Matthews, met Blacklands’ founder, Brandon Ade, in 2016. 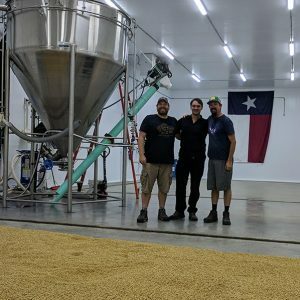 Ade and Michael Harris, Oskar Blues’ Head Brewer in Austin and malt enthusiast, first started working together by incorporating Blacklands malt into specialty beers; then in the fall of 2017 they started talking about a larger project. FORT LAUDERDALE, Fla. – (September 27, 2018) – Known best for its beaches, Greater Fort Lauderdale is riding a new wave as a craft beer destination. Over the past decade, what started as a community of tenacious brew masters, connoisseurs and enthusiasts, is now a thriving beer culture with 15 local nano- and micro-breweries and 32 craft brew pubs on the Greater Fort Lauderdale Ale Trail. Along the map you can experience breweries, beer gardens and brewpubs offering guided tours, an open-air cigar patio and horchata-inspired brew on tap. To learn more about Greater Fort Lauderdale’s breweries, visit: https://www.sunny.org/dining-and-nightlife/drinks/breweries/.